The head of the United Nations has appealed for an immediate halt to fighting in Libya after Khalifa Haftar's forces claimed responsibility for an airstrike on Tripoli's only functioning airport. 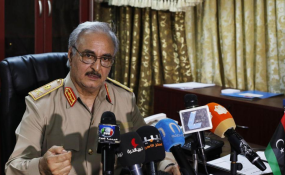 Haftar's LNA has effectively been controlling the east of the country while the General National Congress, GNC, the internationally recognised government, has held the west. He comes from the Firjan tribe, which has large populations mainly in the east, especially around Sirte, Gaddafi's hometown. While in prison, Haftar and the others formed a group called the National Front for the Salvation of Libya with the aim of bringing an end to Gaddafi's rule. "He asked me if I can help and I said yes, of course" says Mohammed Buiser, a former advisor to Haftar from 2014 to 2016. Buiser was living in Dallas, Texas at the time and had also fled Libya due to problems with Gaddafi's rule. "We then arranged for a meeting at the State Department in Washington... .I had a feeling that they did not trust him. And they always thought that he was motivated by self-interest," explains Buiser. "I was actually in Benghazi when he arrived and it caused consternation amongst the national transitional council - which was the body set up to represent the opposition forces at the time - because many of them knew Hafter, his reputation preceded him. And it caused consternation because he immediately began demanding a key role within the rebel forces that were then just taking shape," she adds. But that call did garner Haftar a lot of support from the people "because for the first time somebody [was] taking a military role and [did] not want to take the throne" says Buiser. "Gaddafi was [an] armoured politician. Haftar is just a military ruler," states Buiser. "He talks about machine guns, guns, tanks, airplanes, like a kid who is having fun watching soccer," he adds. "He doesn't have any depth, I would lose him if I would talk to him or relate to him any intellectual idea... He is obsessed by Gaddafi's experience. The only political discourse he knows is Gaddafi's of the coup d'état and then rule the country and give it to your sons and do whatever you want." But is there an overall plan to the actions of Haftar, given he hasn't yet formally announced what the long-term plan is, apart from wanting to clear the country of terrorists? "To create a dictatorship for him and his two sons," he adds.